In this fifty-third archive story by Kristian Bertel, we meet a Baba in a small market town of Maharashtra, India. Driving between locations in the Maharashtra state he photographed this holy man near a road wearing saffron-colored clothing. One of the things that the photographer is fascinated about in Maharashtra and in many other places in India, is that religion is such deeply rooted in the Indian society. In Hinduism a sadhu is a religious ascetic or holy person, who is solely dedicated to achieving moksa, the liberation and release made through meditation and contemplation of Brahman. On a round trip in the Indian state of Maharashtra, the photographer has photographed people and market towns in this region. People as the Baba photographed on the picture above. These holy men are part of everyday life in India and they are encountered everywhere, especially in holy places and at great religious festivals. Sadhus stand for all the activities and efforts, which the believer undertakes to approach the divine and ultimately obtain the liberation from the cycle of rebirths. Self-caste and yoga as well as a life in asceticism and meditation serve this purpose. Maharashtra is the third largest state by area in India and the Sahyadri are a hilly range running parallel to the coast as an average elevation in the lanscape. Maharashtra is a state in India that besides its landscape has some outstanding historical sites, including the caves of Ellora and Ajanta, which are among India's most important historical sites, as well as the state has a highly interesting culture and the Marathi people, where the majority of them are Hindus. Maharashtra is worth visiting with cultural sites, which are not yet crowded with tourists and it is a great place to see the spirituality of India and to enjoy the beautiful, partially untouched landscapes. Many of the sites are outside the cities and these rural areas are also known as the 'countryside' or a 'village' in India and they have a very low population density. In rural areas, agriculture is the chief source of livelihood along with fishing, cottage industries, pottery and more. Baba means father, grandfather or wise old man in India and the name was also used for Hindu and Sikh ascetics the so-called Sannyasis and is also commonly used to their names. Before the British rule, Maharashtra region was divided in many revenue divisions and the lowest administrative one was the village. Village society in Marathi areas included the Patil or the head of the village, which is the collector of revenue. And the Kulkarni, which is the village record keeper and these were hereditary positions. The Patil usually came from the Maratha community, where the The Kulkarni usually was from Brahhmin or higher caste instead. The village also used to have twelve hereditary servants called the Balutedar. The Balutedar system was supportive to the agriculture sector. The servants under this system provided services to the farmer and economic system of village. The base of this system was caste. The servant used to get job according to their castes. There were twelve kinds of servants called Bara Balutedar, such as Sonar, goldsmith, Gurav, temple priest, Nhawi, barber, Parit, washerman, Kumbhar, potter, Sutar, carpenter, Lohar, blacksmith, Chambar cobbler, Dhor, Koli, fisherman, Chougula, assistant to Patil, Mang and Mahar. In this list of Balutedar, Dhor, Mang, Mahar and Chambhar were untouchables. The Maharashtrians are proud of their history and language Marathi. More than three quarters of the inhabitants are Hindus, as well as members of the Muslim, Christian and Buddhist faiths. In Maharashtra you will discover many temples, some of which are several hundred years old. The modern Marathi language developed from the Maharashtri prakrit and the word Mahratta, which is later used for the Marathas and is found in the Jain Maharashtri literature. The terms Maharashtra, Maharashtri, Marathi and Maratha may have derived from the same root. However, their exact etymology is uncertain. The most widely accepted theory among the linguistic scholars is that the words Maratha and Maharashtra ultimately derived from a combination of Maha and Rashtrika. The official language is Marathi although different regions have their own dialects and English is applicable in urban areas. Spoken Marathi language varies by district, area or locality in its tone and a few words. Konkani and Gujarati are also spoken in some areas. Other major dialects include Varhadii spoken in the Vidarbha region and Dangii spoken near the Maharashtra-Gujarat border. As a photographer and traveler in India the market towns are outstanding as well. Places where you can get a good impression of the Maharashtra cuisine, which covers a range from mild to very spicy dishes. Wheat, rice, jowar, bajri, vegetables, lentils and fruit form staple food of the Maharashtrian diet. Some of the popular traditional dishes include Puran poli, Ukdiche modak and Batata wada. Pav Bhaji and Vada pav are dishes that became very popular in the last fifty years. Meals and mainly lunch and dinner are served on a plate called Thali. Each food item served on the Thali has a specific place. In some households, meals begin with a thanksgiving offering of food, the so-called Naivedya to the household Gods. Maharashtrian cuisine has many regional varieties including Malvani also known as Konkani and Varadhi. Though quite different, both use a lot of seafood and coconut. The staple foods of the Konkani people are rice and fish. India is a land full of stories. On every street, on every corner and in the many places in India, life is rushing by you as a photographer with millions of stories to be told. In the archive story above, you hopefully had a readable insight in the story that was behind the photo of a Baba in Maharashtra. On this website of Kristian Bertel | Photography you can find numerous travel pictures from the photographer. Stories and moments that tell the travel stories of how the photographer captured the specific scene that you see in the picture. The photographer's images have a story behind them, images that all are taken from around India throughout his photo journeys. The archive stories delve into Kristian's personal archive to reveal never-before-seen, including portraits and landscapes beautifully produced snapshots from various travel assignments. The archive is so-far organized into photo stories, this one included, each brought to life by narrative text and full-color photos. 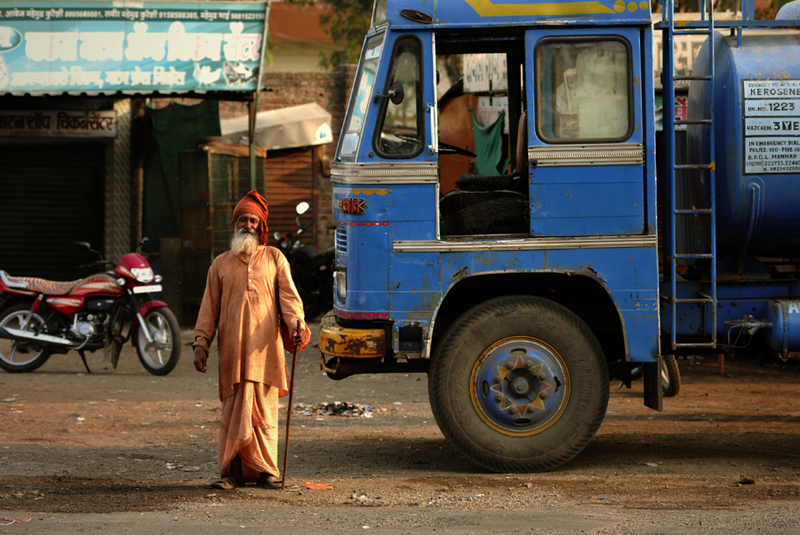 Together, these fascinating stories tell a story about the life in India. India, the motherland to many people around the world, a land of unforgetable travel moments. The archive takes viewers on a spectacular visual journey through some of the most stunning photographs to be found in the photographer's archive collection. The photographer culled the images to reflect the many variations on the universal theme of beauty and everyday life in India. By adding these back stories the photographer's work might immensely enhanced the understanding of the photographs.